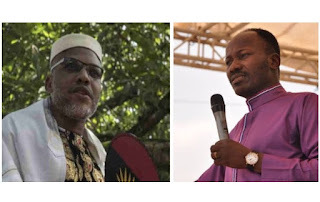 Apostle Johnson Suleman, the Senior Pastor of Omega Fire Ministries (OFM) has predicted massive support for “Biafra struggle” championed by Nnamdi Kanu, the leader of the outlawed Indigenous People of Biafra (IPOB). The clergyman made the prediction during the church’s crossover service, which took place on Monday at the OFM headquarters located at kilometre 132, Benin-Okene-Abuja Express Way in Auchi, Edo state, southern Nigeria. THE NEWS CABLE reports that churches all over the country and the world at large celebrate crossover service every December 31st. At the December 31, 2018, crossover service, Apostle Suleman released 50 prophecies for the year 2019, predicting that “Biafra struggle” would gain massive support. “Biafra struggle to gain massive support,” number nine of Apostle Suleman’s 50 prophecies released on Monday said. “Nnamdi Kanu to be embarrassed both locally and internationally,” number 40 of the Apostle’s 50 prophecies for 2018 had said. The IPOB leader had berated the Apostle over the prediction in one of his broadcasts on radio Biafra, saying it was the devil that spoke to Suleman and not God. “Nothing your pastors say come to pass, was it not Apostle Suleman that said I would be disgraced locally and internationally but now I’m not, it was the devil that spoke to him not elohim.. instead of him to say Nnamdi Kanu will bring to the fore news that will expose some people. I do not expect more from him because he is a Northerner, so he wants to preserve one Nigeria,” Kanu had said in his December 2018 broadcast.